A few women get in a Police Station of Sidharth Nager, a district in the northern state of Uttar Pradesh, India. The people in the surrounding villages were upset by the drought conditions prevailing in their region. They undertake alot of rituals to make Indradev (the God of rain) happy. According to the tradition and belief if the ruler of the area was given a public bath. Indradev would be pleased, and rains will follow. To their entire satisfaction, after the bath, a light rain did follow. The era of Raja was over way back in 1947 with the declaration of India being a Republic. The police Chief protects the safety of an area, and here the Chief gets the equal status of a Raja. The women, to appease and conciliate the God of Rain, gave a bath to the Police chief publicly. The ritual includes that the water from LOTAH (a small metal pot) gets used for the bath. The remaining water is to be used to bath Lord Shiva in a temple. The women living near the police station knew that there is no King nowadays and decided that the security in charge should be given the bath. 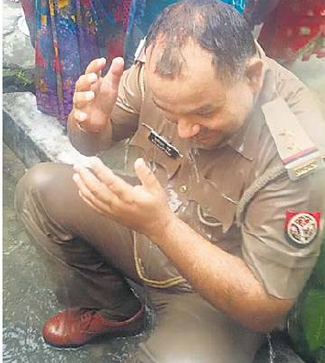 They were able to convince the Police inspector Ranvijay Singh of Kapilvastu police station for the ritual of getting drenched publicly while on duty. The women used the LOTAH and bathed him in his uniform as shown in the picture. He did not agree with his colleagues, who asked him to refuse. They protested but in vain. The best thing is that after bathing him, there was a light rain. This happened on the November 23rd, 2015. The newspapers of the area gave a good coverage to this incredible ritual. In case you understand Hindi, click the following link.